Member of the Asteraceae or Compositae (aster family). Common family members include dahlia, cosmos, marigold, zinnia, lettuce and strawflower. Small flower heads up to 1 inch across with one row of ray flowers and a center of disk flowers, at branch stem ends. Stems branched, leafy, up to 20-28 inches long. Has very aromatic foliage but the flowers are not fragrant. 36-41F up to 4 days in water. These attractive white and yellow, daisy-like flowers compliment most floral bouquets, and when dried, can be made into tea or tincture and ingested as a pain buffer. Feverfew contains niacin, iron and vitamins A and C, and is thought to contain aspirin-like qualities. Eating feverfew leaves every day may prevent or lessen migraine headaches by slowly reducing the associated smooth muscle spasms. Dried leaves in sachets may deter moths, an infusion of leaves and flowers is a mild sedative. Chrysanthemum: Greek for golden flower. The Compositae or aster family is vast, with over 20,000 species, and is also one of the most developed families. 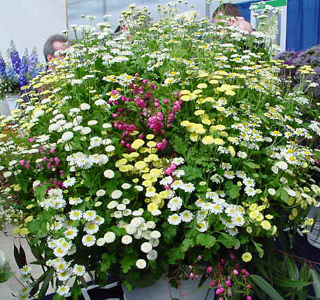 It was named Compositae because the flowers are actually a “composite” of many individual flowers into one head. Hence, when children pull one “petal” off at a time, saying “she/he loves me, loves me not”, they are actually removing a complete flower, not just a petal.